Waves however require a bit more abstract thought. In normal day-to-day life, we say that the ripple and wave in the water is one and the same thing. 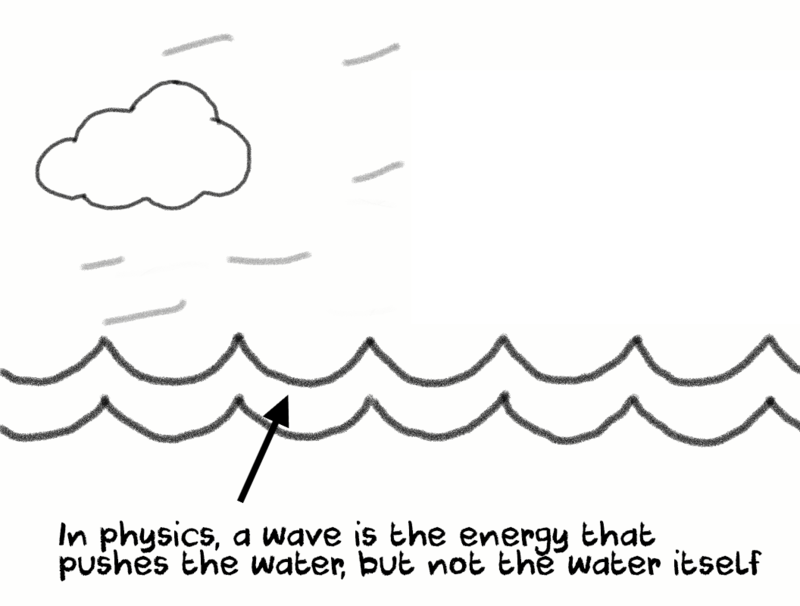 But in physics, the wave isn’t actually the water moving up and down. In physics, the wave is the energy that pushes the water molecules to take a ripple shape. This energy makes the water go up and down, until it dissipates and the particles returns to their resting position. Some waves can only travel in a medium. Sound waves for instance, need air to go from one place to another. But, as some popular movie posters say, “In space, nobody can hear you scream.” That’s because vacuum can’t transport sound waves. However, other types of waves don’t need a medium. X-rays, Radio waves, microwaves go through anything – air, vacuum, water, you name it. 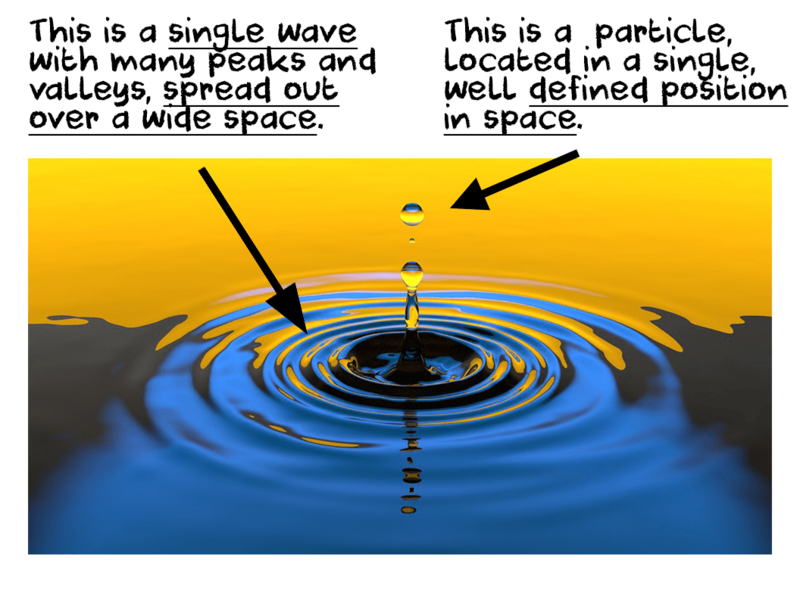 The difference between a wave and a particle has some practical implications. 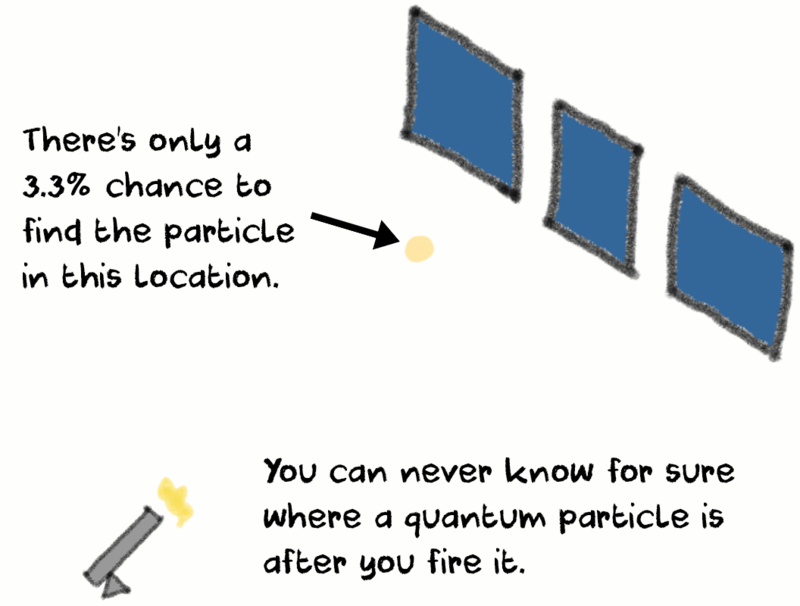 A particle exists only at one location at a given time. 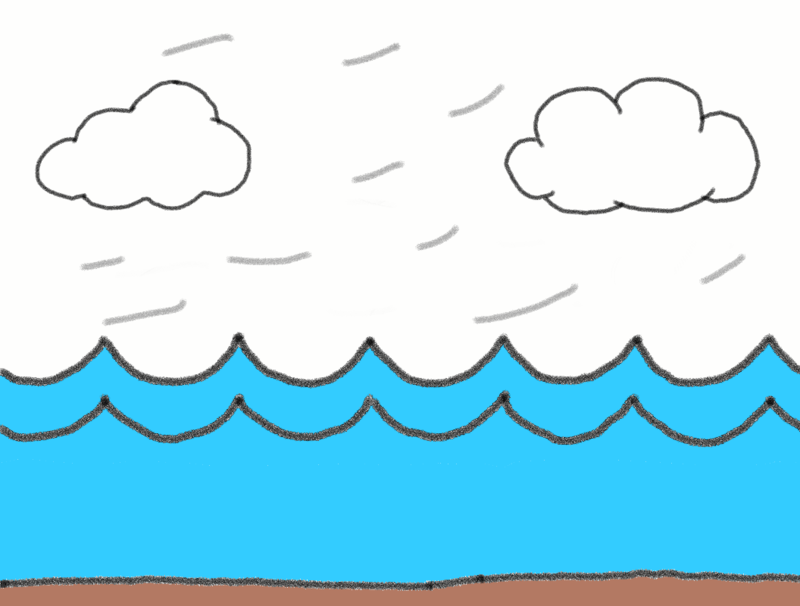 But a wave is spread out across a lot of space, so it doesn’t have a defined location. The water droplets in the photo above can be localized into a single position. But the wave itself cannot. 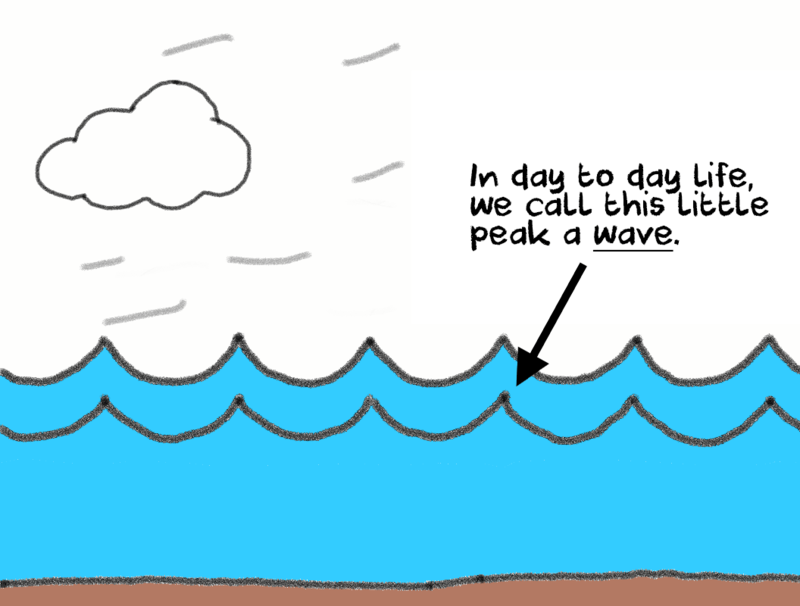 The peaks and valleys are not separate waves, but instead they are components of a single wave. In classical physics, waves and particles were distinct from one another. You are either one or the other. But classical physics had a hard time figuring out if light is a wave or a particle. 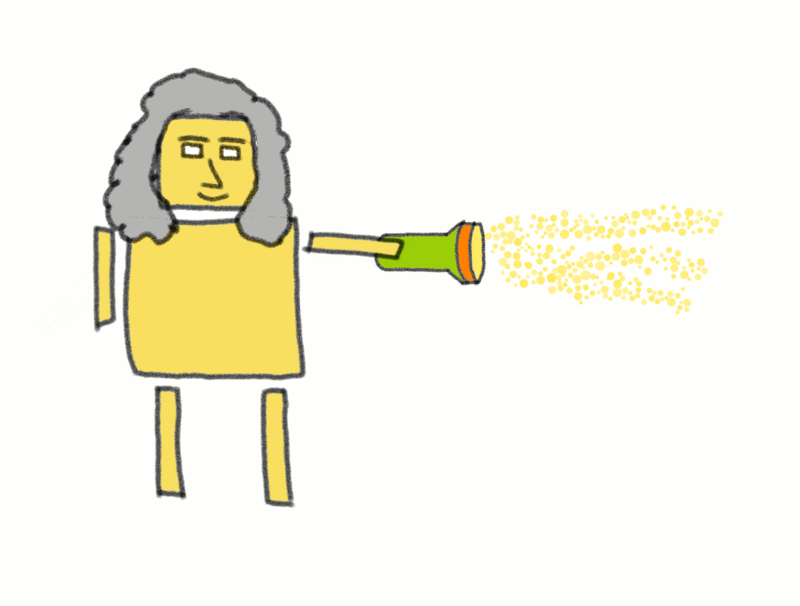 Newton said light was a bunch of particles (we now call them photons, but the term didn’t exist in Newton’s time) that come out of a light source. But many other scientists argued that light was actually a wave. This conversation lasted for a few hundred years, until one James Maxwell convincingly proved that light behaves like a wave. From this point onward, light was generally treated as a wave. Despite this, the wave theory of light wasn’t able to explain all of lights properties. It was a better approximation and descriptor than the particle theory of light, but it was nevertheless an incomplete version. Something was missing. In 1905, Albert Einstein, demonstrated the photoelectric effect. Among some of its implications was that in certain conditions light had to behave like particles. In doing so, he also came up with the basic notions of quantum physics. So by now, both wave and particle theories of light were proven to be correct. Light was both a wave and a particle at the same time. Yes, light is both a wave and a particle simultaneously. 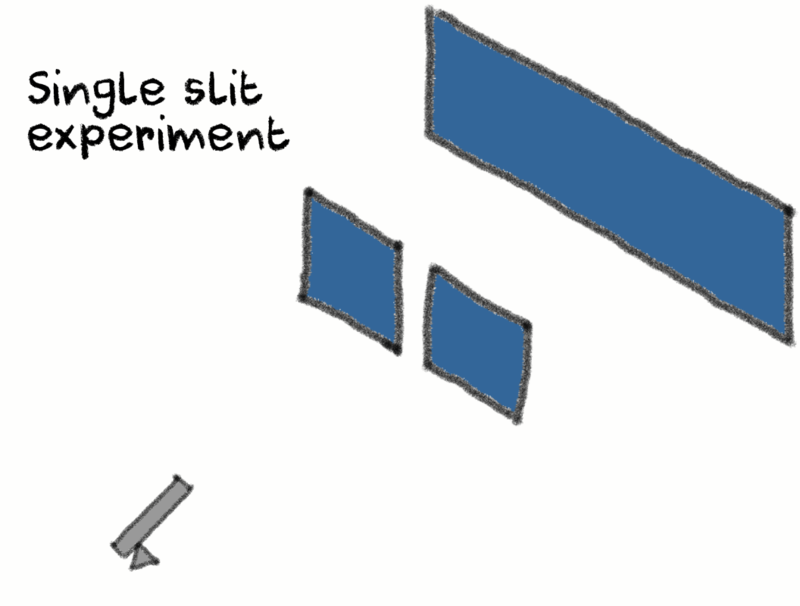 To give you a visual sense of how such a thing can be possible, we will use the most widespread and relevant experiment of quantum physics: the double slit. In this experiment, physicists use a specialized particle gun that shoots photons towards a screen. But between the screen and the light source you will have a plate with one or two slits. What we want to do is to light up the screen behind the slit. To do this, you fire a whole bunch of photons through it, machine gun style. Everything turned out as expected. 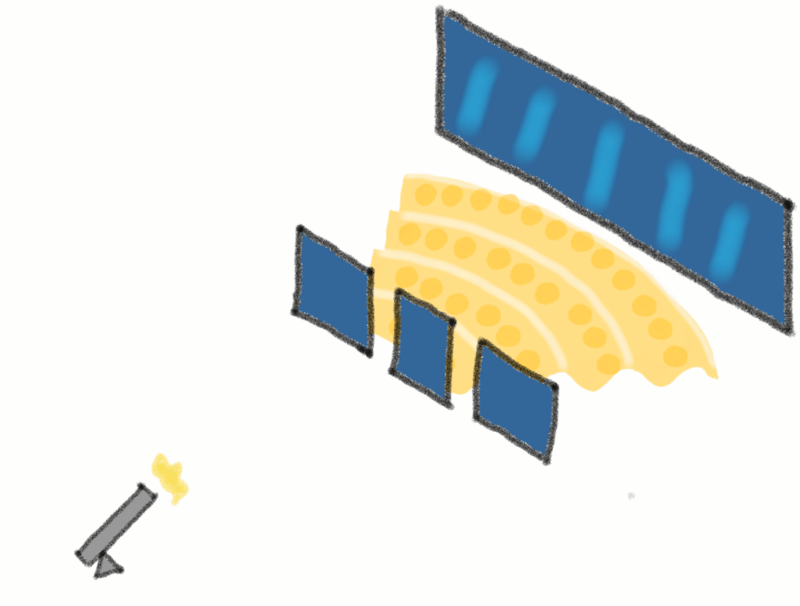 Most photons concentrated on the part of the screen directly behind the slit, while a few others were spread out across the entire surface. Now let’s replace the single slit plate with the double slit one. Logical enough. 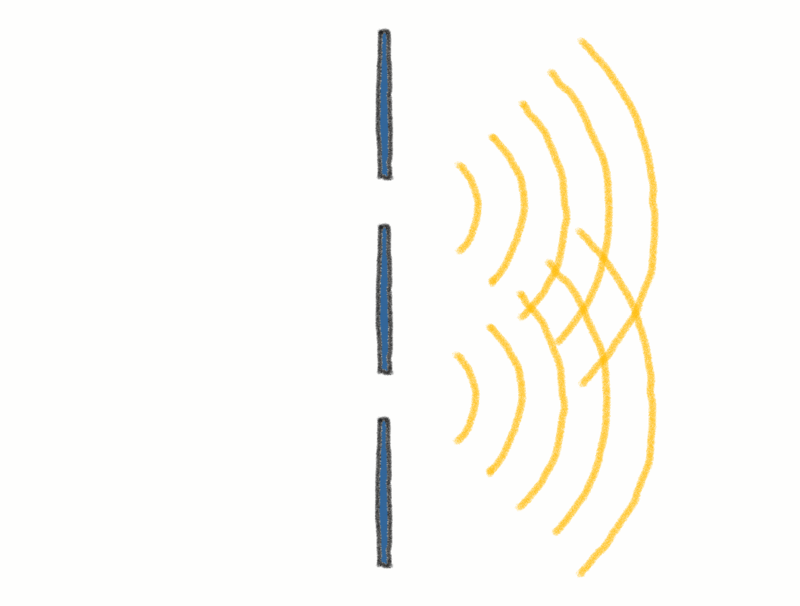 After all, the plates block most of the photons, but the ones that manage to pass the two slits will form 2 stripes behind them. This is the point where things get messy. 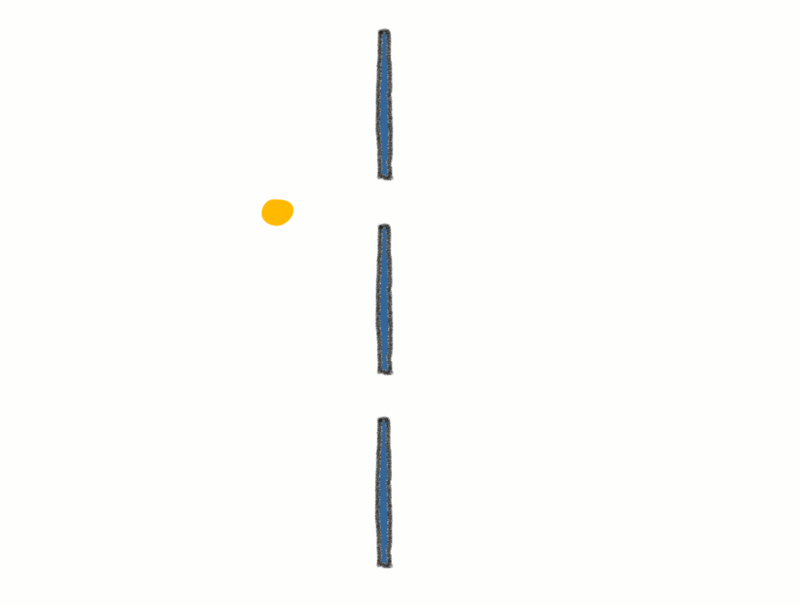 If light was made only of particles, then you would see two stripes, each one behind one of the slits. Instead, we now have something known as an interference pattern. This pattern takes shape when you have two waves that touch each other. These interference points then move forward and touch the screen, creating those stripes we saw earlier. Here’s a visualization of it all. Light being both a particle and a wave simultaneously isn’t something that should happen in classical physics. How can one thing be in two states at once? It’s as if you had a coin that could be simultaneously be both heads and tails. But this is what all experiments proved, time and again. Thinking of light as both a wave and a particle simultaneously describes all of its properties perfectly. Trying to see it as just a wave or just a particle won’t. Soon enough though, physicists discovered it wasn’t just photons that could be two things at once. Basically anything that is microscopic in size, such as neutrons, photons and atoms, behaves like both a wave and a particle simultaneously. Classical physics had reached its limits. So, a new theory was created to explain these weird phenomena. They called it quantum theory (or quantum physics/mechanics). And the people who wanted to learn more about this new field of physics found even stranger things than the wave-particle duality. 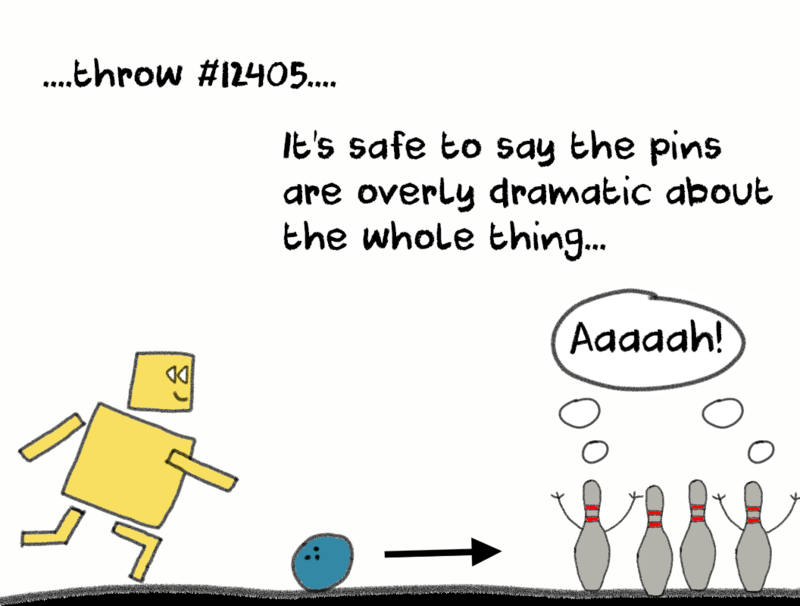 In classical physics, throwing a bowling ball in exactly the same way will make the ball follow the same path 100% of the time. The ball doesn’t do anything special. It just follows the path and trajectory you set out for it each them you threw it. Its fate was determined the moment you released it from your hand. This is a critical principle of classical physics called determinism. Now let’s go back to our two slit experiment. 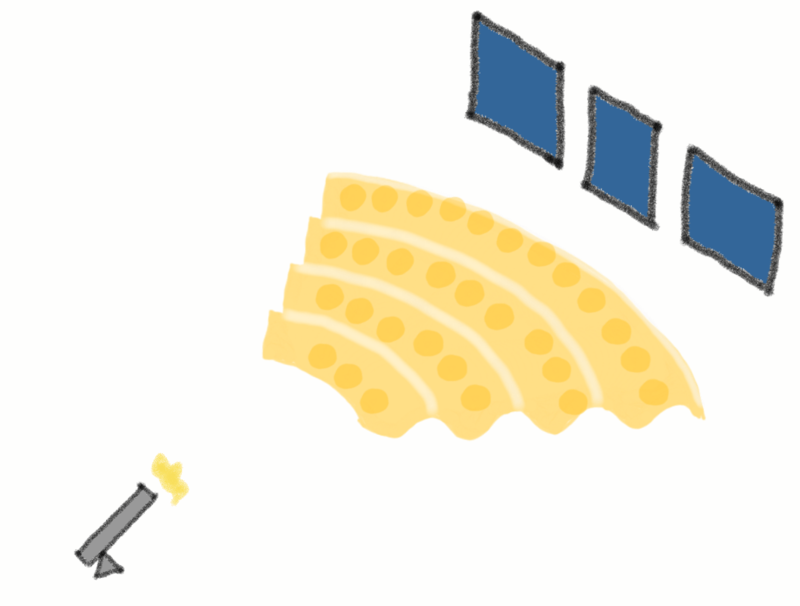 We’ve seen how particles form an interference pattern on the screen if you fire a large amount of them towards the slits. However, each particle follows a wildly different and unpredictable path, even if the gun points in exactly the same spot. 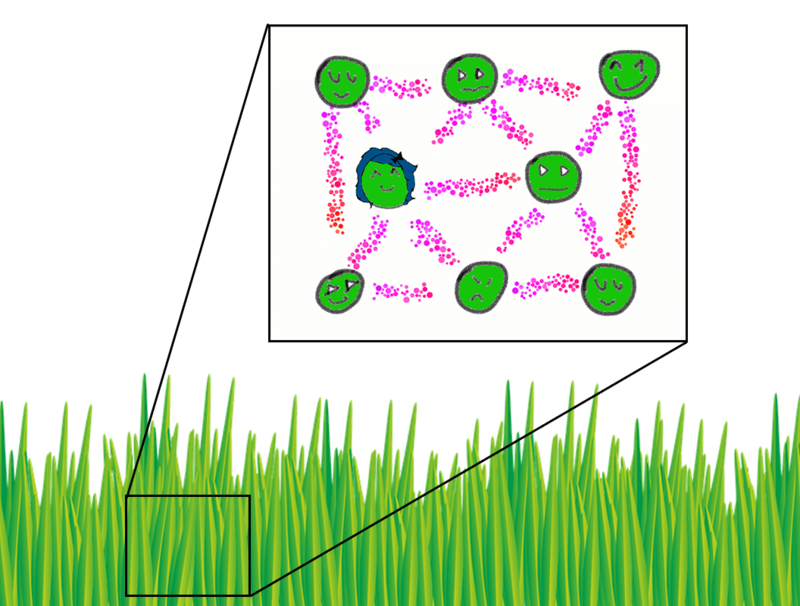 For this reason, almost no two particles land on exactly the same spot. Indeed, the places where they do land on the screen seem to be almost random. 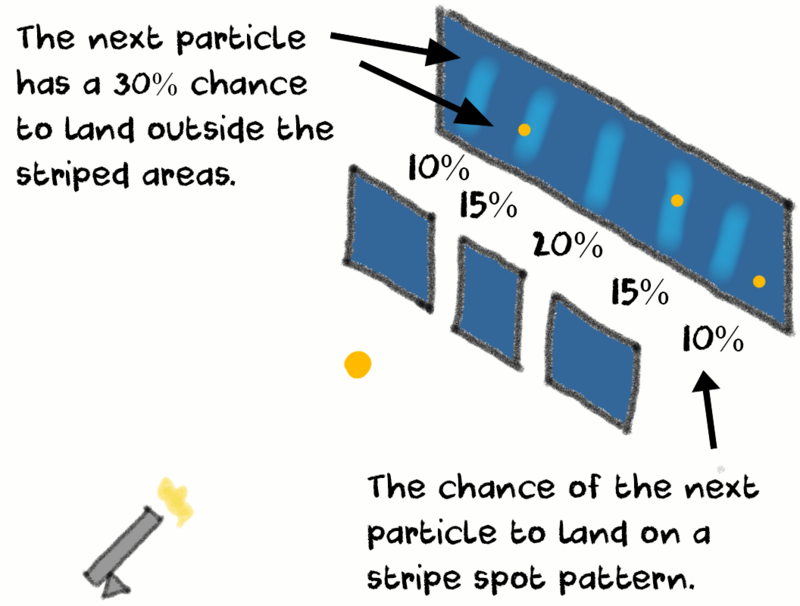 We say almost random, because the particles seem to have a higher probability of landing on one of the areas corresponding to the five stripes. The numbers aren’t really that accurate, they’re just there to help you visualize. However, this isn’t “probability by ignorance” as in the case of the coin toss. This is true probability, meaning that it isn’t affected by any sort of variable. 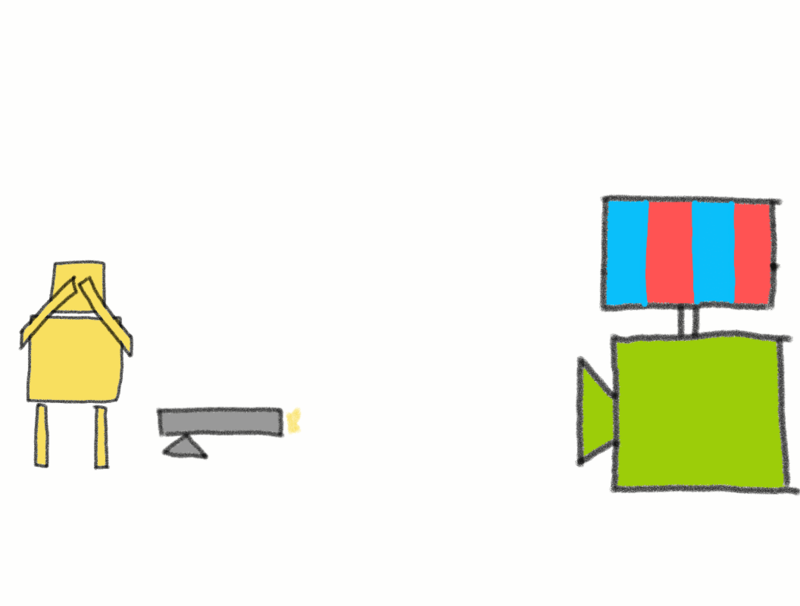 It is absolutely impossible to know beforehand where a particle will land on the screen. In other words, determinism doesn’t apply to individual particles..
What quantum physicists discovered was that at microscopic levels, the Universe is governed by probability rather than determinism. It was very probable that a particle would land on one of the 5 interference stripes, but you couldn’t be sure that it would do so. It’s almost random. This went against everything scientists knew about the laws of physics. Einstein, a firm believer in a deterministic Universe, summed up his objections to quantum probability with the phrase “God does not play dice”. What he meant was that the Universe is ordered and predictable. Everything is interconnected in a long cause and effect chain, and with sufficient information you can predict anything that will happen because nothing is left to chance. Even though you launched the bowling ball on a certain path, it randomly seemed to skip it and go in an entirely different direction and towards a completely different destination. Scientists didn’t easily accept the wave-particle duality of the microscopic Universe. Neither did they like the seemingly random behavior of particles. So they tinkered with their experiment. They figured that by firing particles in rapid fire, like a machine gun, they ricochet and bounce of each other. This would explain why particles can form wave-like interference pattern and also the probabilistic way they land on a screen. 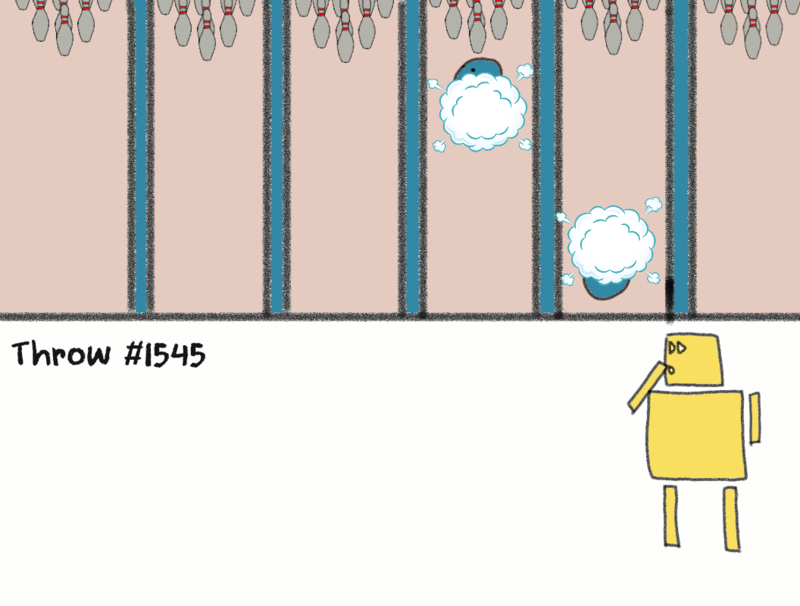 So instead of firing the particles like a machine gun, they decided to shoot them one by one. 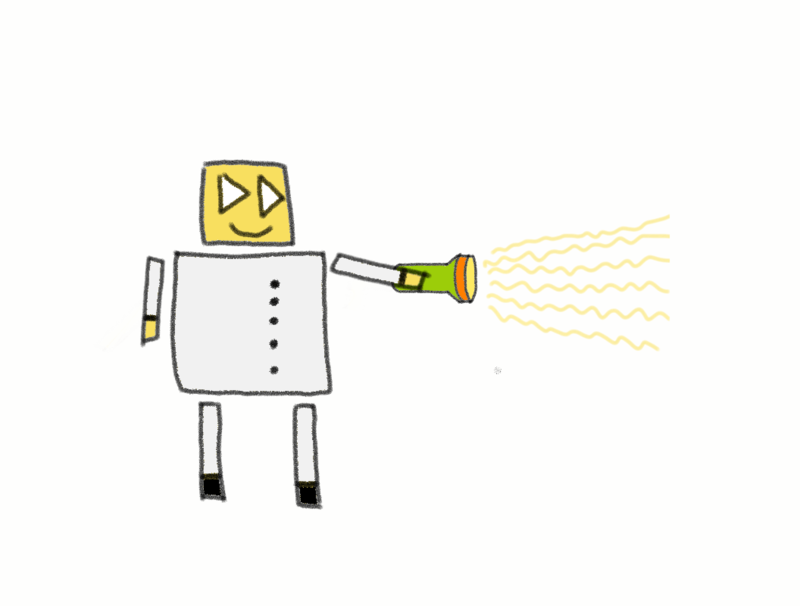 The gun’s firing rate was adjusted, the experiment initiated. 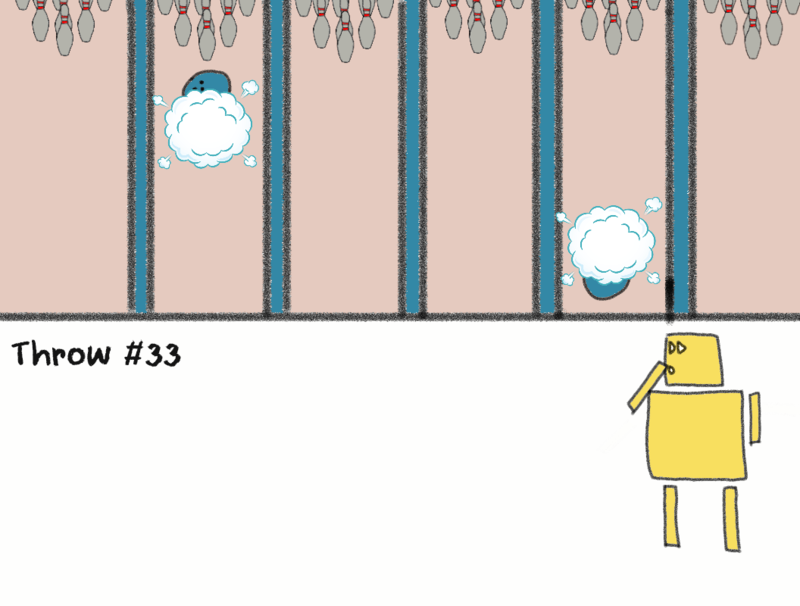 All they had to do now was to wait while a few thousand particles landed on the screen. 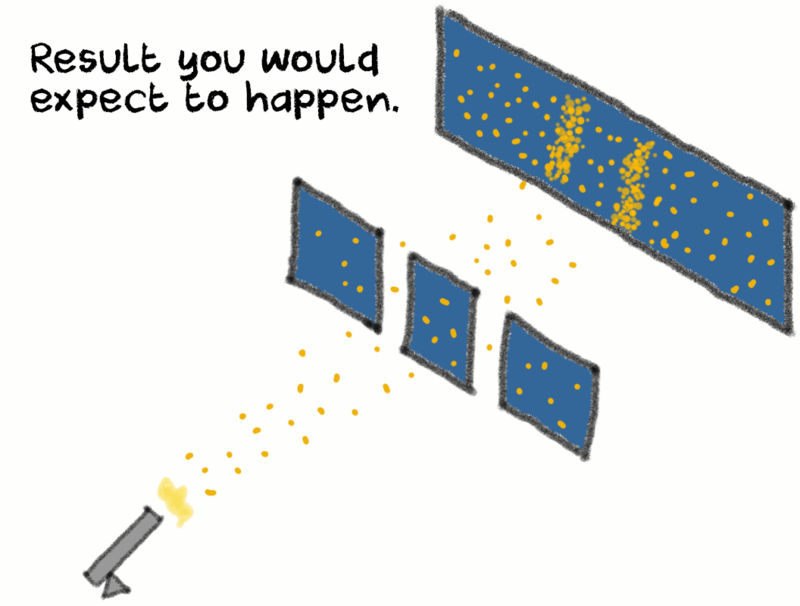 This proved once again that microscopic particles behave in a probabilistic fashion, rather than a deterministic one. However, this time around, the real problem was that you still ended up with an interference pattern. But the stripes only appear if you have two waves that make contact with each other. And yet the gun fired just one particle at a time. 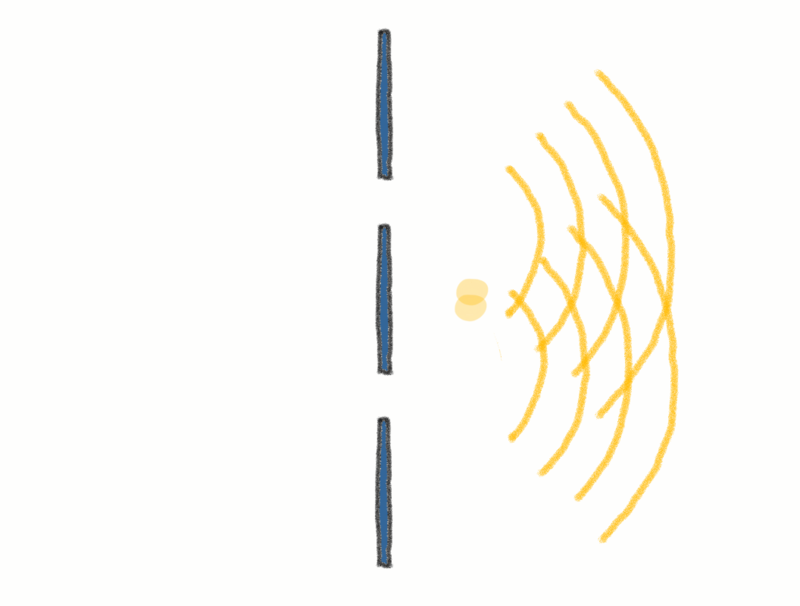 So the only possible way for a single particle to form an interference pattern was if it could somehow pass through both slits, and then interact with itself on the other side. On top of all the other issues scientists found with quantum physics, now they had to deal with the fact that a particle could somehow be in two places at the same time. The weirdness just didn’t seem to end. Microscopic objects such as neutrons and photons can be both waves and particles at the same time. The microscopic Universe behaves in a probabilistic fashion rather than a deterministic one. 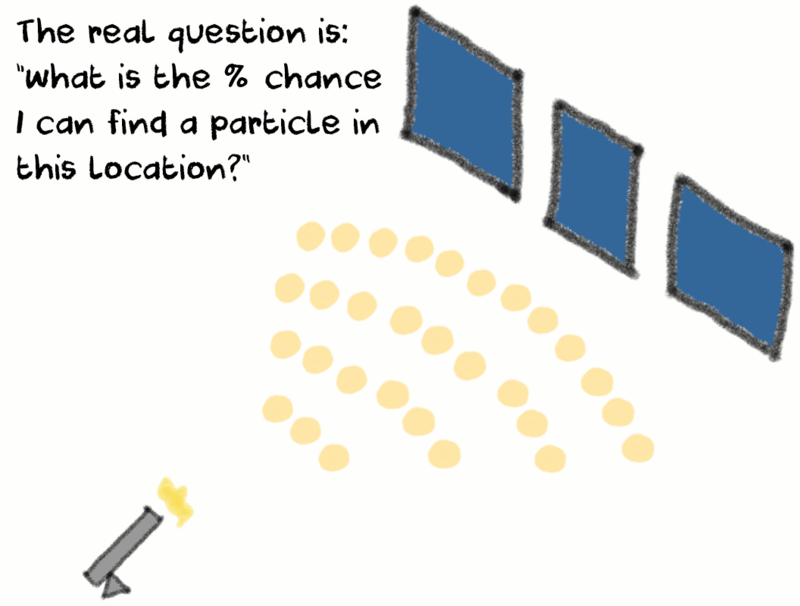 A particle can seemingly be in more than one location at the same time. To better understand all of these 3 aspects, scientists came up with a new concept called a probability wave. 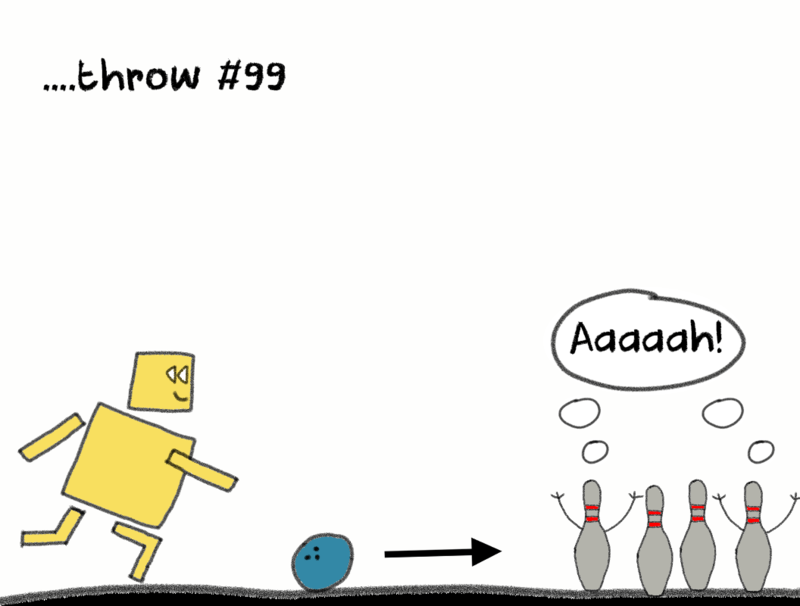 When you propel classical objects forward, such as as bowling balls, you give them a predetermined path to follow. However, when you fire a particle, it stops having a clearly defined position in space. It also doesn’t have a predefined trajectory and destination. Instead, the particle is now governed by probability. This means there is x% chance for you to find it in position A, y% chance to find it in position B, z% chance to find it in position C, and so on. Instead, the particle can occupy multiple possible positions and follow many possible paths on its way to the screen. 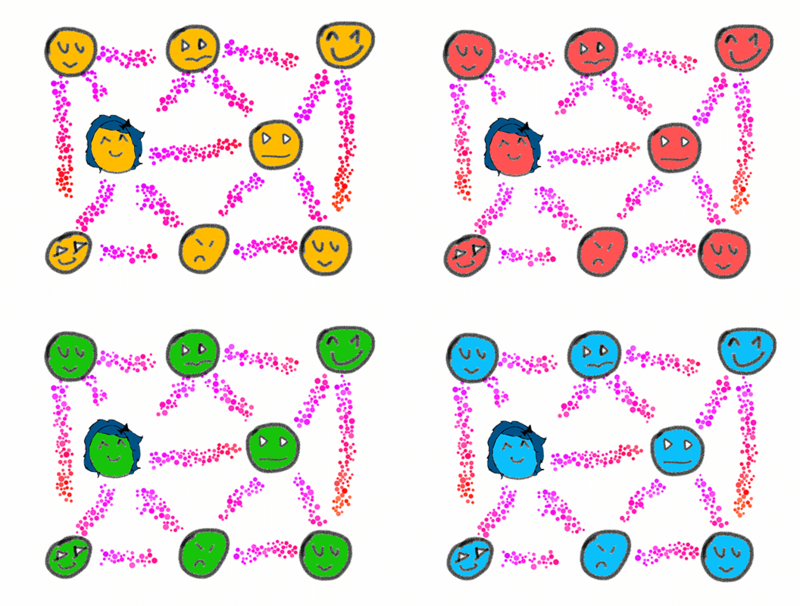 Out of all these possible paths and positions, the particle ends up choosing just one position and path, but it is impossible to know beforehand which path/position it will take. In the sketch above there is just one particle. 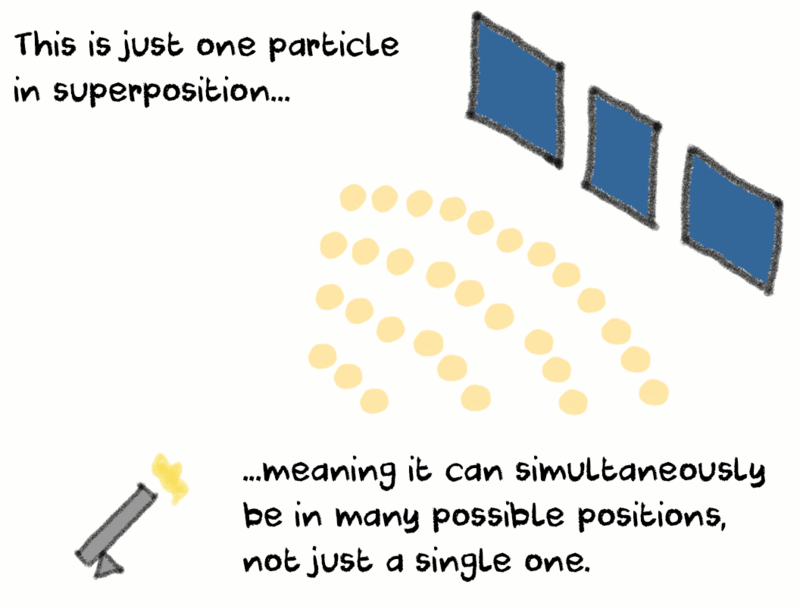 This is important, so we’ll say it again: there is only one particle. But each transparent shape represents just one possible position where you might find the particle. 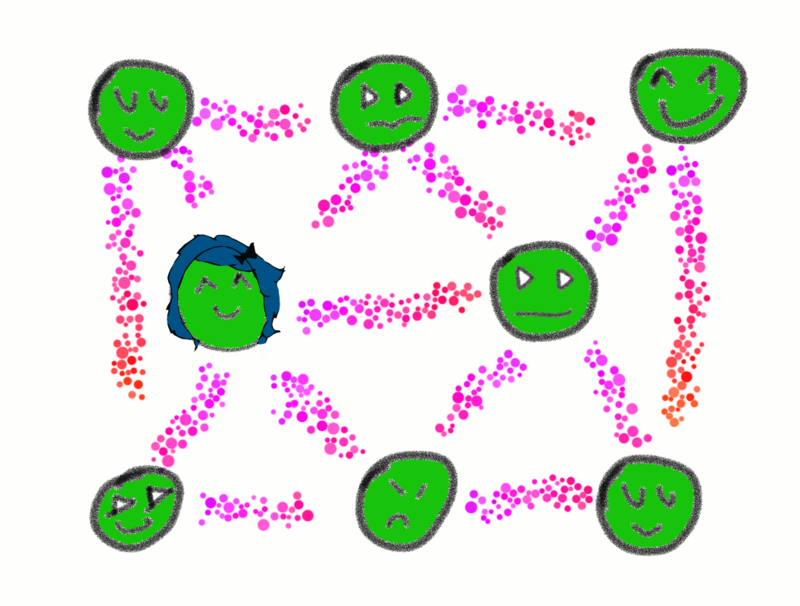 As you can see, the particle’s potential positions are clumped up together in certain locations while avoiding others. This corresponds to a wave’s peaks and valleys. We will point it out again, but there is only one particle within that probability wave. In fact, you can actually say that the probability wave and the particle area all one and the same thing. 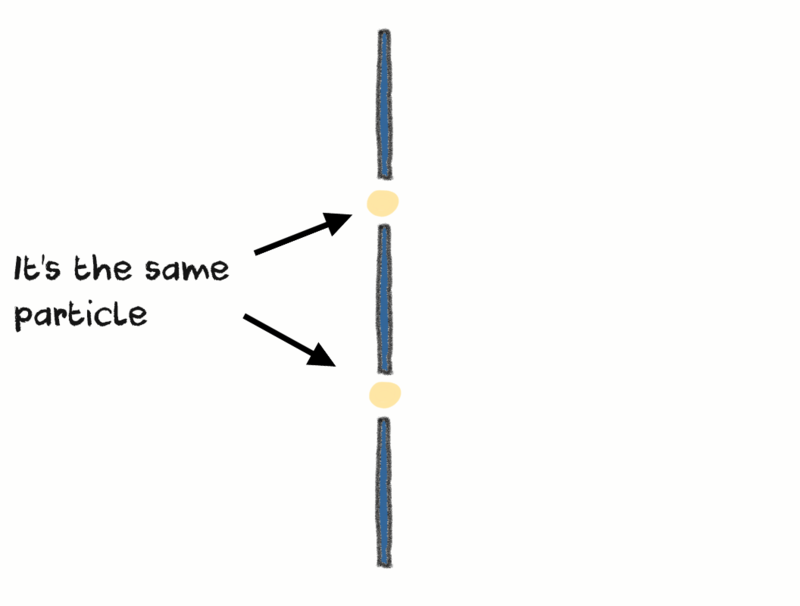 Now that we have a visual representation of how a particle behaves, let’s see how it managed to pass through both slits. Be in multiple states simultaneously, such as both a wave and a particle at the same time. Occupy many potential positions, all at once. A particle can be both a wave and a particle simultaneously. 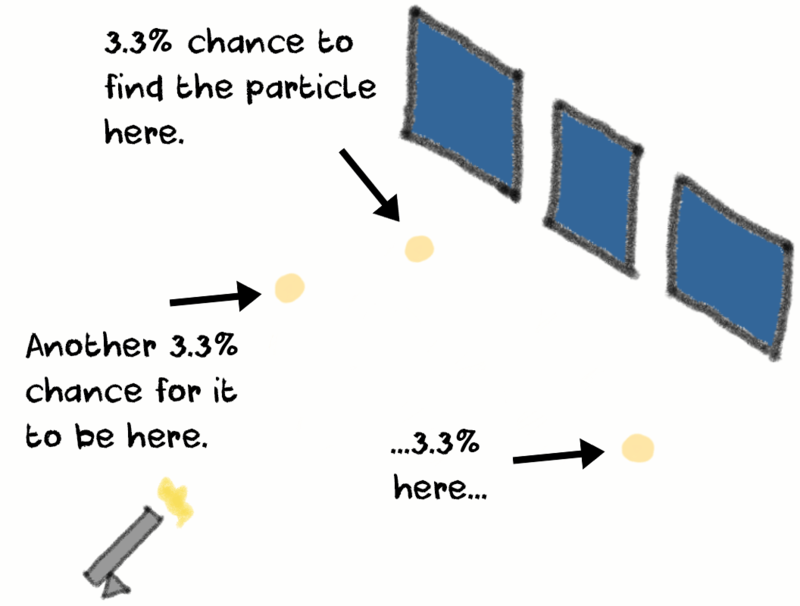 At the same time, a particle doesn’t have a fixed position, but rather multiple potential positions you might find it in, as we’ve seen in the probability wave section. 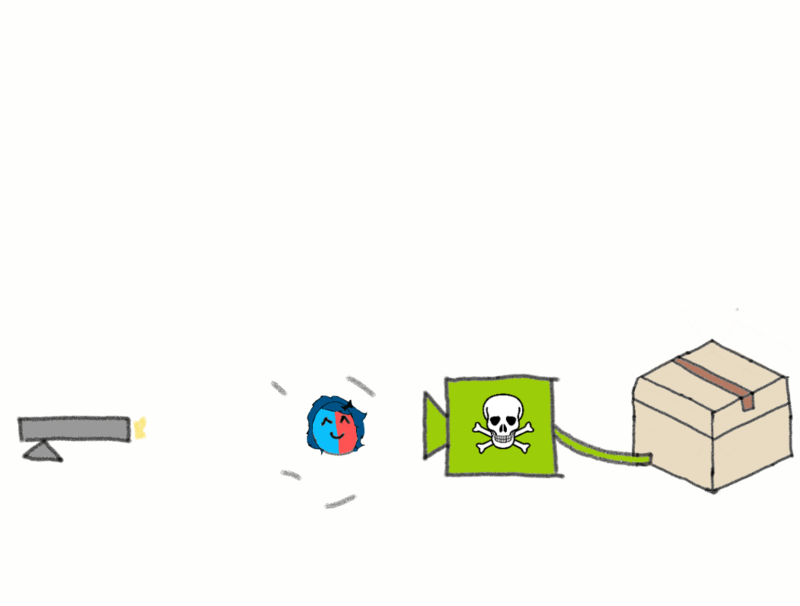 Put these two concepts together, and you now have the concept of superposition. The probability wave is just a single particle in a state of superposition. 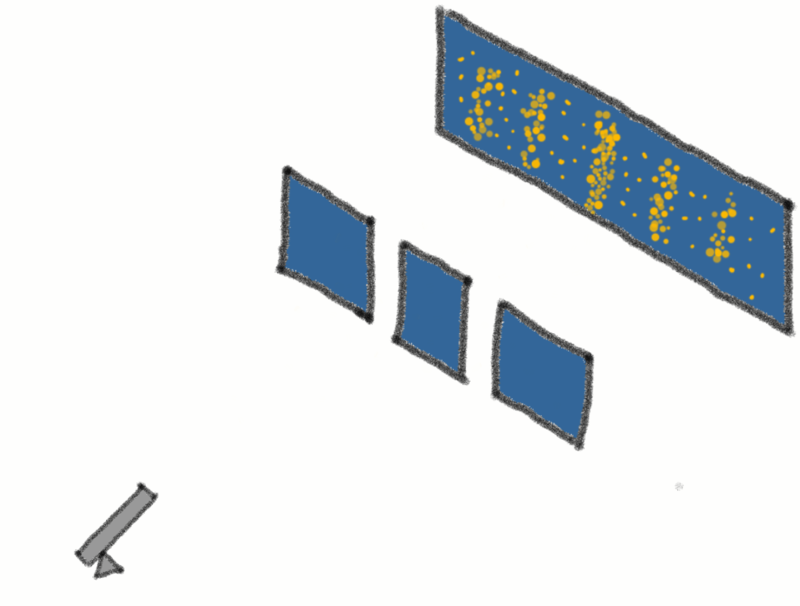 Once the probability wave reaches the screen, its superposition randomly collapses at a single point, with a higher probability to do so in one of the 5 interference stripes. This still didn’t explain how the particle can somehow pass through both slits simultaneously. 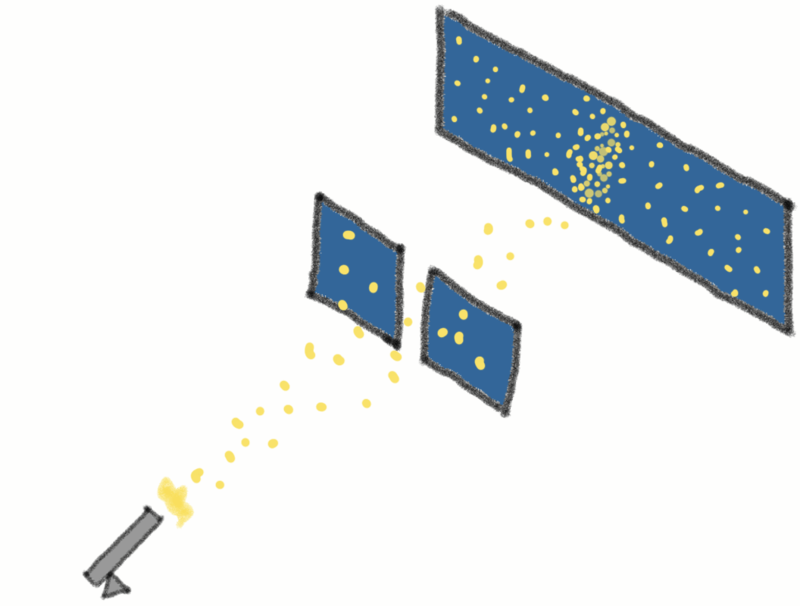 The only thing left to do was to see the particle in action as it passed through both slits simultaneously. Scientists had had enough of quantum shenanigans. This time they did something they should have done all along: put a detector in front of the slits and see the particle in action. They warmed up the gun and shot the first particle. Then they fired the second particle. One by one until the pattern on the screen took shape. A few more particles left. Finally, they fired the last particle. But the pattern that emerged didn’t make any sense at all. Other than the detector, they didn’t do anything different. What was going on? The results didn’t seem to make any sense. 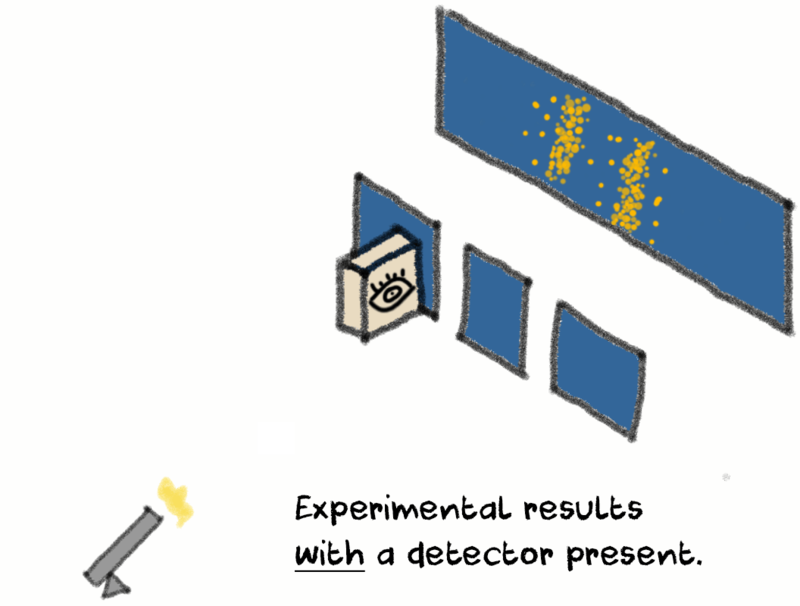 The detector didn’t interact with the particle in any way during the experiment. It served a single purpose: to observe the particle as it passed through the slit. It didn’t physically interact with the whole experiment, so it couldn’t affect the result. In practice however, things were different. The two stripe pattern can only appear if the particle loses its wave-like properties. In other words, the particle is now just a particle, and not a wave. This explains why you get two stripes instead of an interference pattern, since the particle now behaves like a bowling ball, meaning it goes through in a straight direction through a single slit. They reran the tests but they got the same result each time. By now, the result was inescapable: the act of measuring and observing a particle changed the properties of a particle. The particle was no longer both a wave and a particle at the same time. Observation forced it into being just a wave or just a particle, but not both simultaneously. If a particle “knew” it was being watched, it refused to pass through both slits at the same time. Things become even stranger once you look at what happens to the probability wave when the detector measures it. 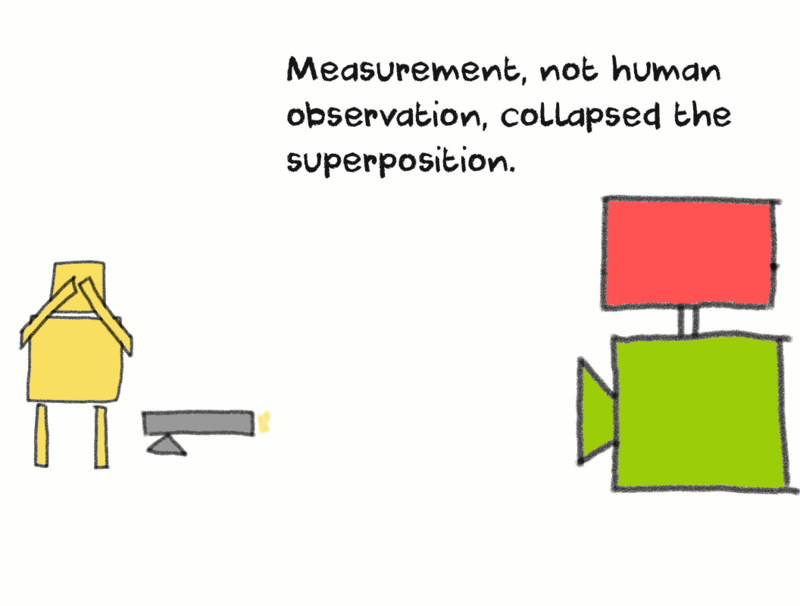 Making a measurement collapses a particle’s superposition into a single point. This means the particle ceases to be in many possible positions, and instead acquires a single definite location. Not only that, but the particle loses its wave-like properties, and becomes just a simple particle. This shouldn’t happen in a world governed by classical physics. 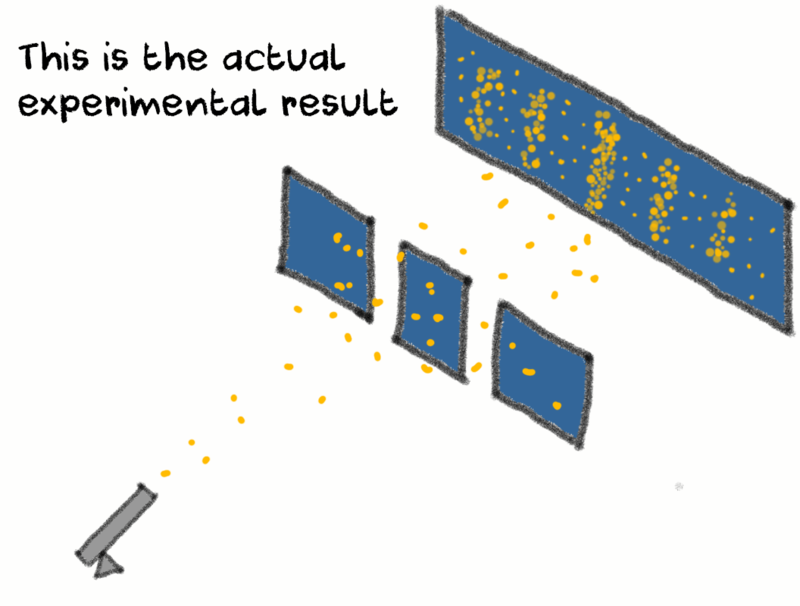 Simply by making an observation, you can control whether a particle is a wave or a particle, or if it can be in multiple potential positions at once. But you can’t observe a particle being both a wave and a particle at the same time. In quantum physics, this phenomenon is called “the measurement problem” and has been around almost from the very beginning. The measurement problem was (and still is) the biggest mystery of quantum physics. And scientists being scientists, tried to find an answer to this. But all of them failed. 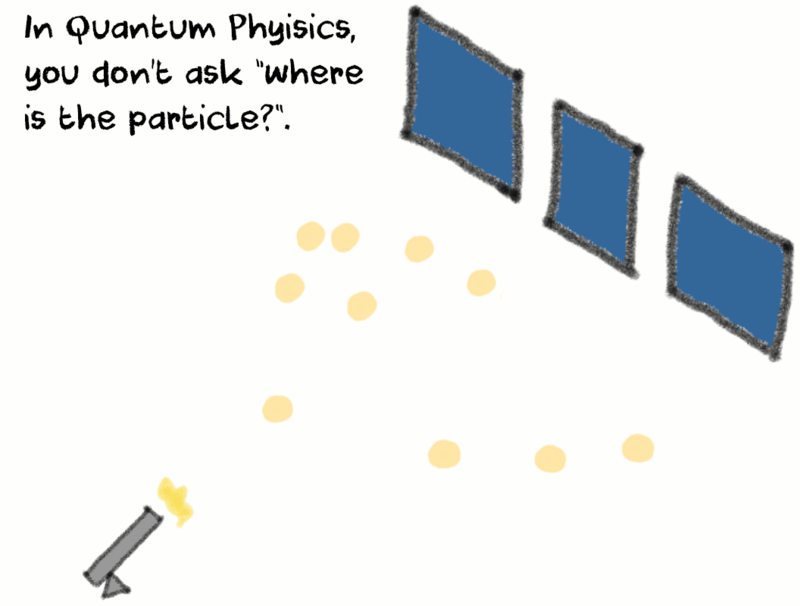 To this day we don’t know why a simple observation changes the nature of a particle. It’s as if simply looking at something changes the physical world. So in order to make sense of the mathematics of it all, they created various interpretations of quantum physics. Each interpretation of quantum physics tries to explain why an observation changes a particle’s behavior. But each interpretation has its own deep philosophical implications on the nature of reality. We’ll get to those in a bit, but first, let’s see how the strange laws of the quantum realm transform into the predictable and intuitive classical realm. Einstein described quantum entanglement as “spooky action at a distance”. And honestly, you can’t blame the guy. Let’s say you have 2 separate particles called Alice and Bob. Alice and Bob go through a strange scientific process and now share a voodoo connection. This means that what happens to one, also happens to the other. Let’s imagine now that these particles are colored either red or blue. Unfortunately, Alice and Bob have very different tastes in the matter. As a result, they never agree to share the same color. Thanks to the voodoo connection, if Alice decides to be red, then Bob will automatically be blue and vice versa. 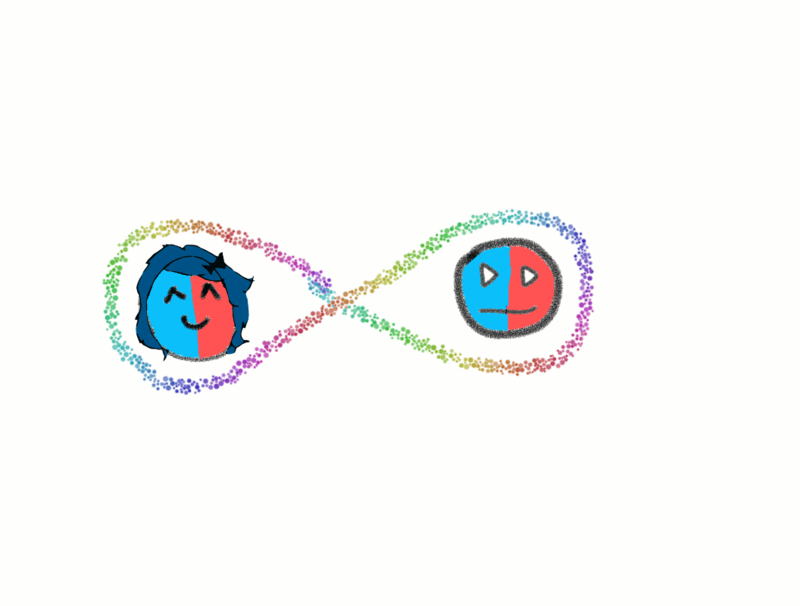 However, Alice and Bob are both quantum particles, so until we observe them, they are in a state of superposition, meaning each of them is simultaneously red and blue. Once you observe and learn the color of one particle, you automatically learn the color of the other one. In other words, once you know Alice is red, then you automatically know Bob is blue. This voodoo connection between Bob and Alice is called quantum entanglement, and says that you cannot measure and observe the quantum state of one particle without also observing the other. 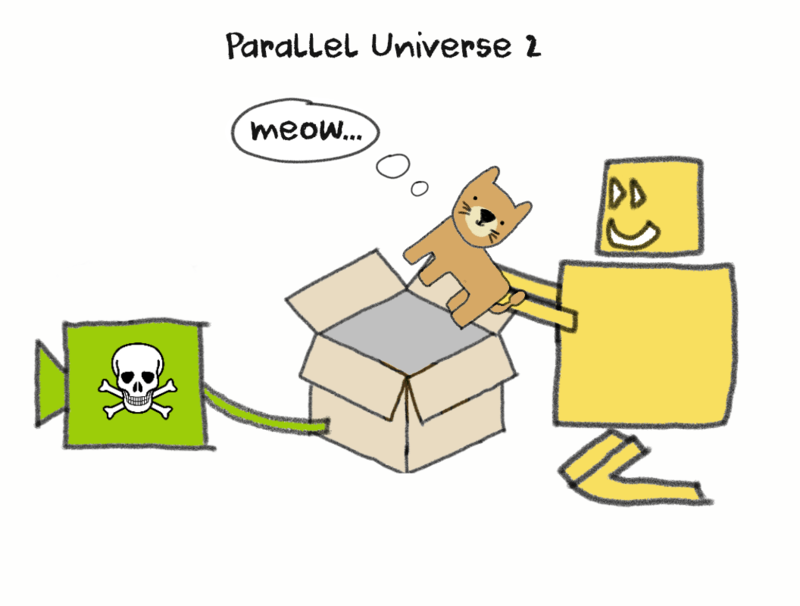 Two or more particles in a state of quantum entanglement is called a quantum system. 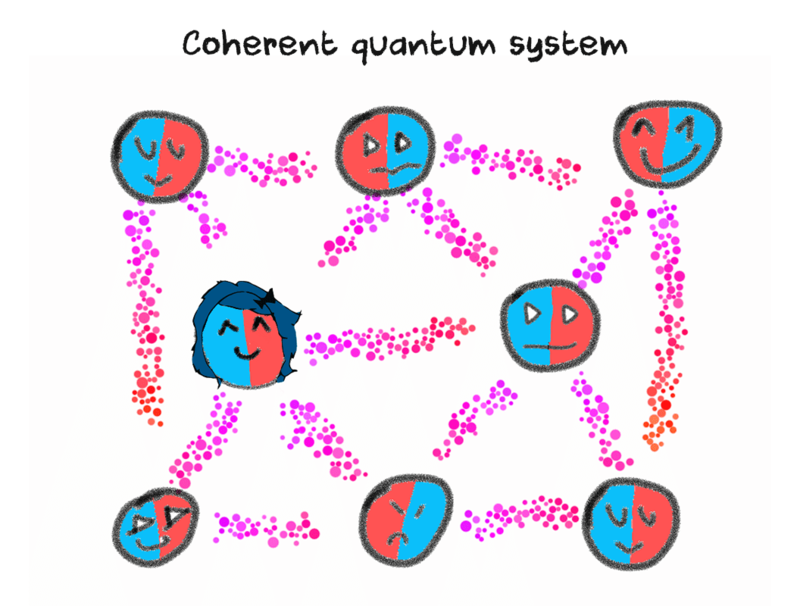 Quantum coherence describes a quantum system where all of its particles are in state of superposition. Making a measurement on Bob collapses his superposition, as well as Alice’s, thanks to quantum entanglement. 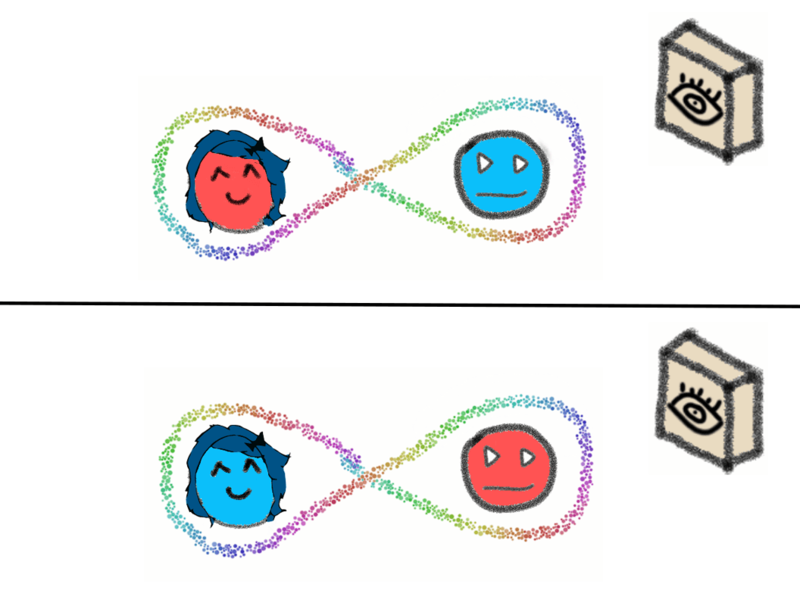 At this point, neither of the two particles in the quantum system are in state of superposition, and instead each have adopted a single definite state, meaning Bob is now just blue and Alice is now just red. At this point, the quantum system has experienced decoherence. But quantum entanglement isn’t limited to just Bob and Alice. After all, everything in the Universe is made of particles just like them, and they interact and become entangled with each other all the time. It’s impossible to isolate Alice and Bob’s quantum system from other particles in the environment. So over time, more and more particles join their quantum system. Imagine it as a web of particles. However, the more particles you add in a quantum system, the harder it is for all of them to stay coherent with one another. So at this point in time, the particles start to look for a single state all of them can be in. In our example based on colors, they want to settle on just one particular color. 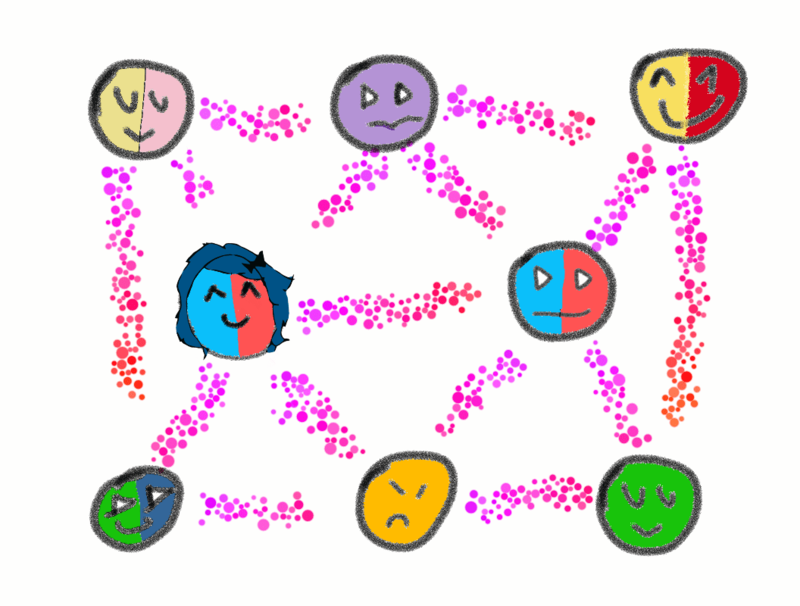 After numerous failed attempts, they reach a stable consensus, and adopt a single state for all of the particles in the system. 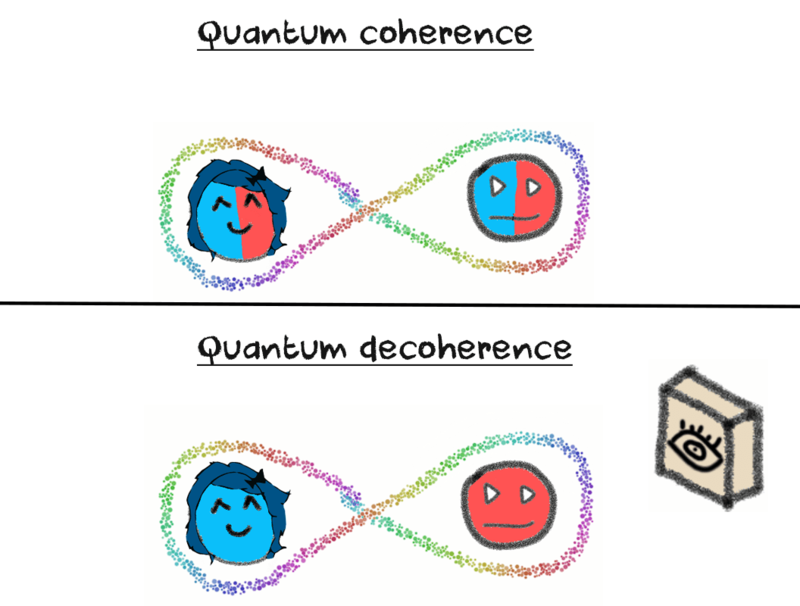 Practically, the quantum system has decohered. By now, it is said the quantum system has generated information. This information is classical physical in nature, meaning it already exists before measurement is done on it. Physicists talk quite a lot about decoherence. One school of thought says it explains and solves the measurement problem, since particles can only achieve the single common state (in our case by becoming the color green) by collapsing the superposition once the quantum system becomes too complex. Most physicists disagree with this view, and hold that the measurement problem is still alive and well, even when decoherence is involved, for reasons that will become clear in our final section: how to interpret the measurement problem. Why does observation cause a particle to behave in such wildly different ways? Many scientists have tried to figure out the measurement problem, but not one of them has managed to fully understand why particles behave the way they do once you observe them. What we have instead are interpretations of quantum physics. These all start from the same mathematical source, but interpret and make sense of the numbers and calculations from a different point of view. Each of these quantum physics interpretations has its own philosophical implications on how to view reality. Neither of these can be labeled as “false” or “correct”. Instead, you’ll see that some of them are more plausible than others. 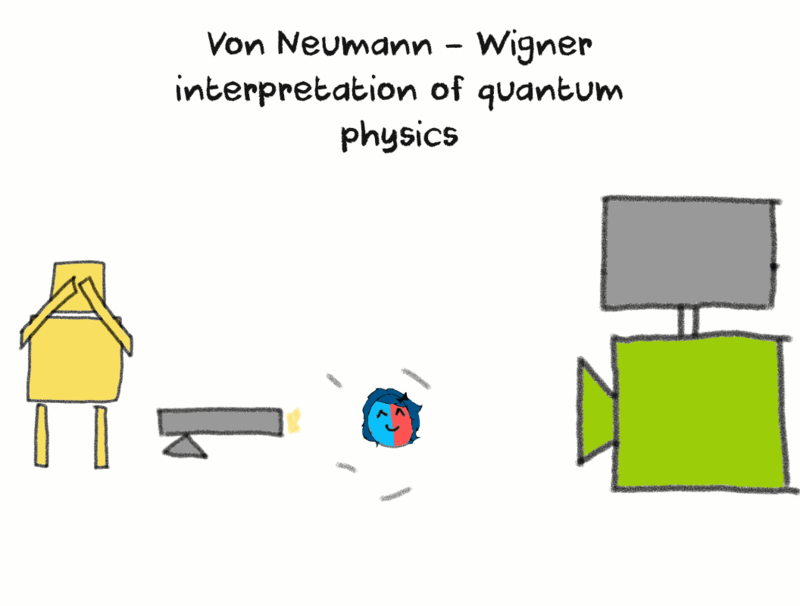 Sometimes described as “consciousness causes collapse”, the Von Neumann – Wigner interpretation is one of the earliest in quantum physics, before concepts such as decoherence and entanglement were fully understood. Only a very tiny minority of scientists subscribe to this interpretation, and for good reason. The “consciousness causes collapse” theory is an intellectual root for New Age thinkers who say that the Universe doesn’t really exist, and it is all a construction of our own imagination. To see why, we need to go back to the double slit experiment. 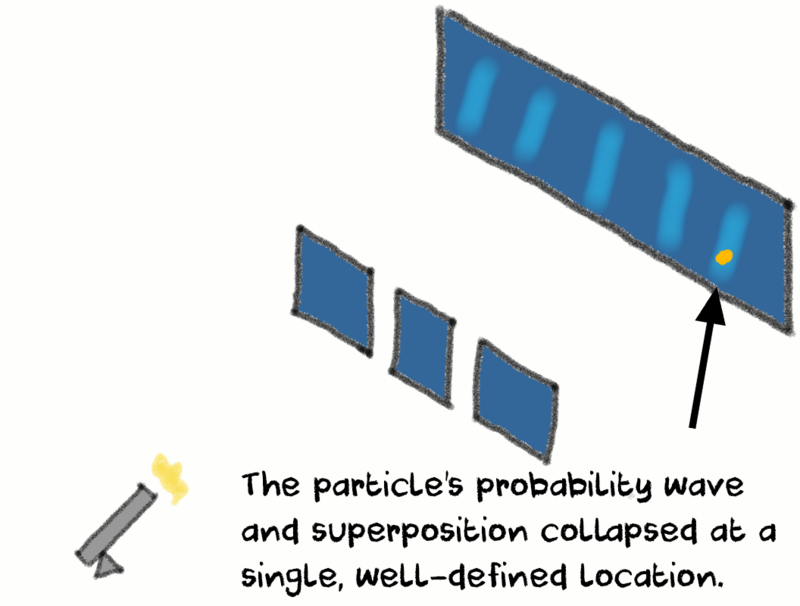 Observing a particle causes its probability wave and superposition to collapse into a single location and state. The overwhelming majority of scientists argue that it is the measuring itself which causes the collapse. However, the measuring device doesn’t act on its own. It took a real, live person to make the device, set it up and then read its result. During this whole process, the person’s consciousness became entangled with the measuring device. When the measurement takes place, it’s not actually the device which collapses the wave probability and superposition into a single point and state, but the consciousness of the observer. However, if consciousness causes collapse and not the detector, then this implies that the particle’s superposition and probability wave collapses not at the moment of measurement, but only once a conscious observer sees the results of the measurement. As far as physicists and philosophers are concerned, this interpretation of quantum physics has profoundly strange implications for what is reality. Let’s talk again about Alice and her colors. Before measurement, Alice’s color is in superposition, meaning it is simultaneously both blue and red. Measuring Alice’s color is subject to quantum probability, meaning we have a 50% chance of observing Alice as blue, and a 50% chance of observing Alice as red. According to the Von Neumann-Wigner theory, the collapse only happens at the moment a conscious observer sees the result of the measurement. Until then, Alice is still in a superposition of both blue and red. What this also implies is that the detector itself is then in a superposition of both red and blue, and this superposition only collapses once we look at the measurement. Basically, Alice only became red after it was measured by the consciousness of the observer. To help you get an even better idea of the gravity of such a conclusion, we’re going to use the famous Schrodinger’s cat thought experiment. In the first scenario, we finalize the measurement by looking at the screen, which tells us if Alice is red or blue. 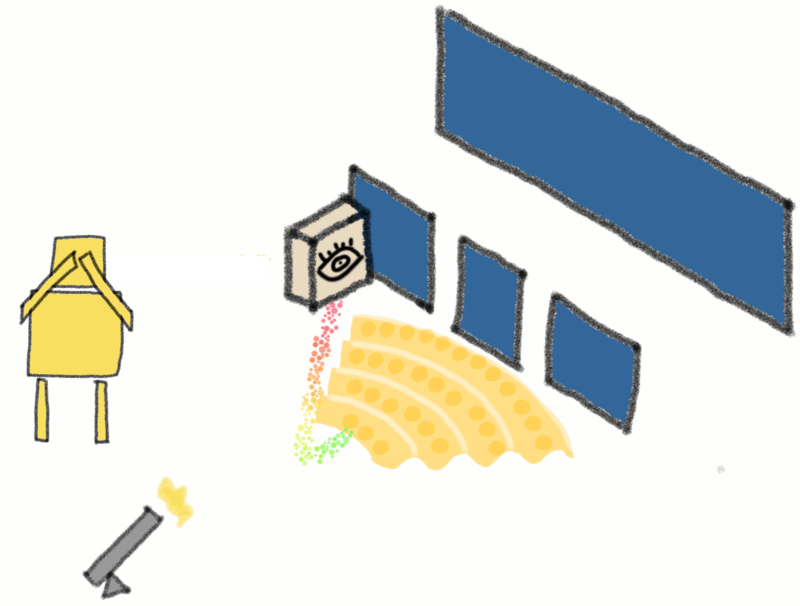 For this experiment, we’ll replace the screen with a box that has a cat inside. 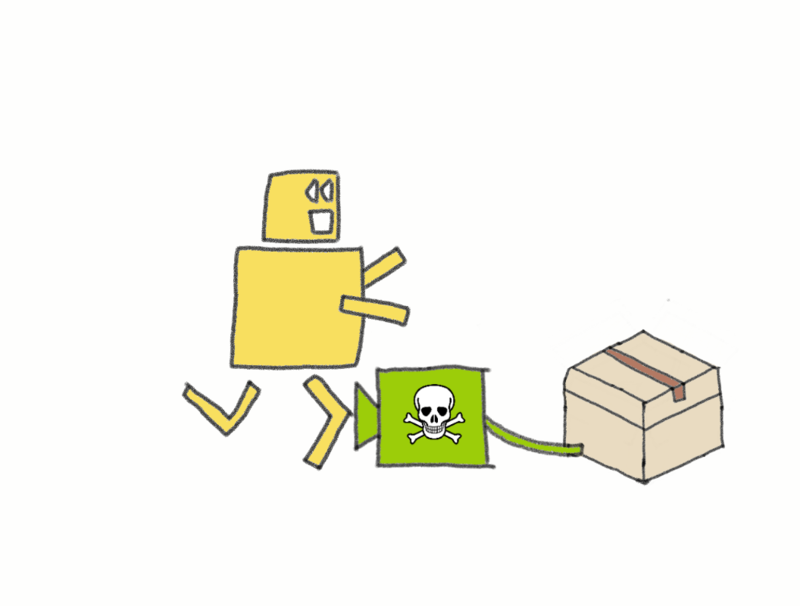 Instead of sending an electrical signal to the screen as in the first experiment, the measurement device will now release poison into the box if Alice is red, while not doing anything if Alice is blue. In other words, the cat dies if Alice decides to be the color red. 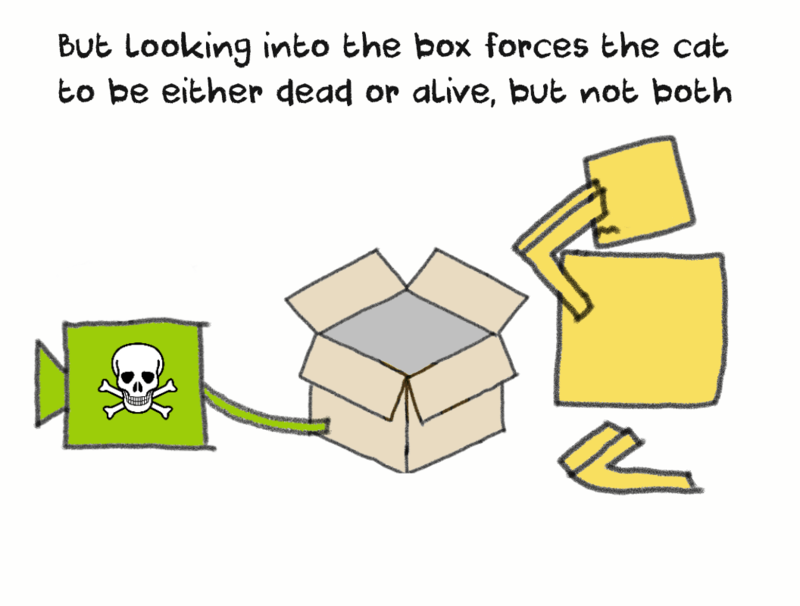 The only way measurement can be done in this experiment is to open up the box to see if the cat is dead or alive. 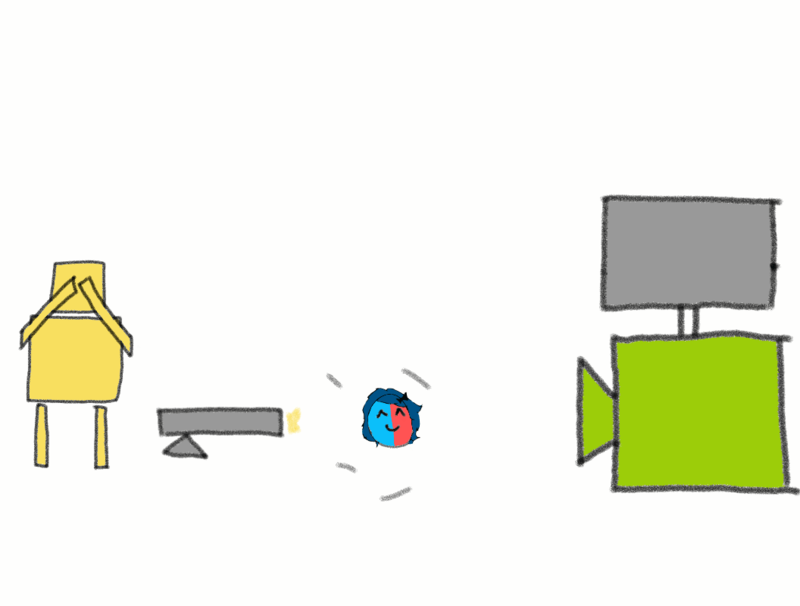 But until the moment of measurement, Alice is still in a superposition of states, meaning it is at the same time both blue and red. released the poison that killed the cat. not released the poison; the cat is alive. 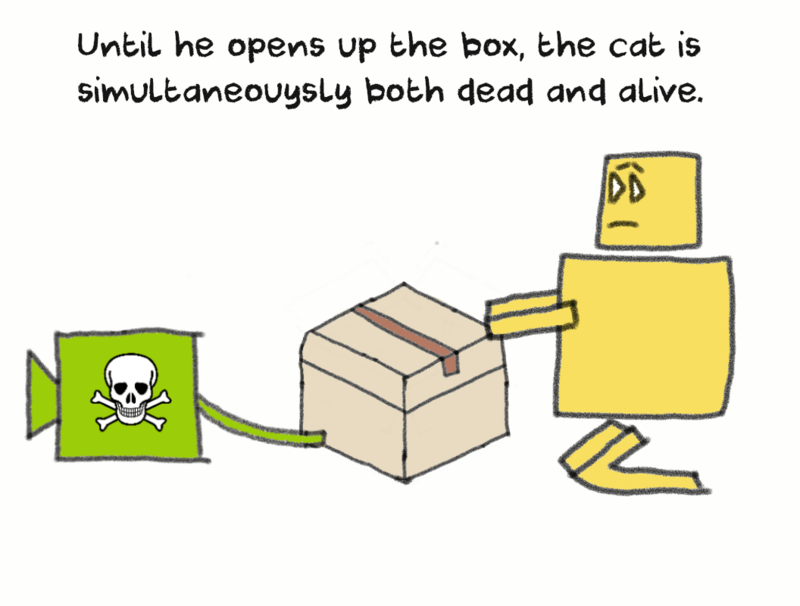 In other words, the cat is also in a superposition where it is both dead and alive at the same time. And that is one paradox of the Von Neumann – Wigner interpretation. You have a cat that is simultaneously both dead and alive, until you make the measurement. But once you open up the box, you collapse the superposition, and the cat is now either one of those two states (there was a random 50/50 chance of seeing Alice as either red or blue). This contradicts one crucial aspect of physics that we talked about in the beginning of the article: realism. According to realism, the Universe does its thing even when humans aren’t there to see it happen. The dinosaurs were wiped out by a meteorite even though it struck Earth 65 million years ago when no one was alive to witness the impact. 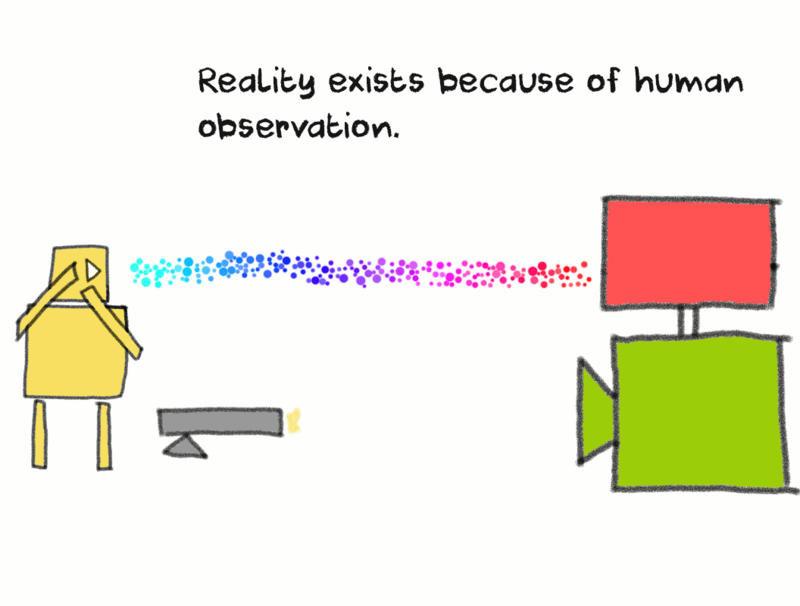 Interpreting Schrodinger’s cat thought experiment using the Von Neumann – Wigner theory puts you, the conscious human observer, as a creator of reality. Until you opened the box, there was a chance the cat would have been alive. But once you lifted the lid, and saw that it wasn’t, you forever eliminated that possibility. The whole point of Schrodinger’s thought experimented is to prove the bizarre and paradoxical implications of the “consciousness causes collapse” interpretation. Out of all the interpretations, it is the most alluring. Numerous, modern spiritual philosophies hang on to this interpretation, using it as a crutch in order to justify the existence of esoteric concepts such as “cosmic vibrations”, “spirit” and so on. Nicknamed “shut up and calculate”, the Copenhagen interpretation is the most widely believed view of quantum physics. According to the Copenhagen interpretation, the superposition of a particle collapses at the moment of observation. 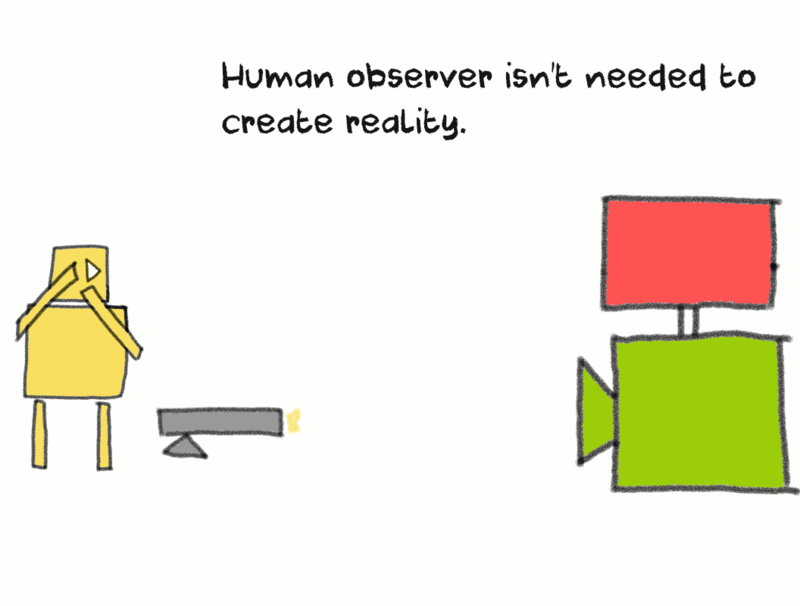 It doesn’t really matter who makes the observation. 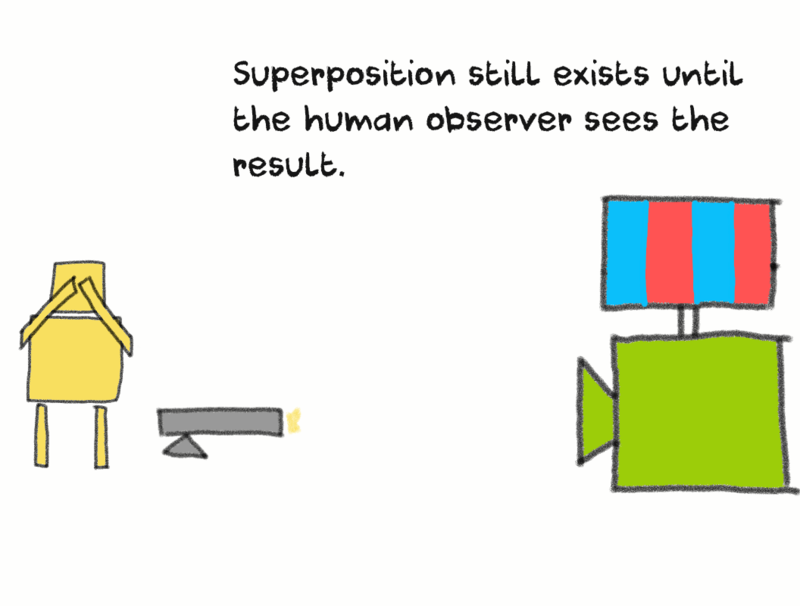 In other words, a particle’s superposition collapses once the detector makes a measurement, even if a human hasn’t seen the result. In the early days of the Copenhagen interpretation, it was the simple act of observation that collapsed the wave function. The mere act of measuring the neutron caused it’s superposition to collapse. It didn’t really matter if a human was there to see it or not. 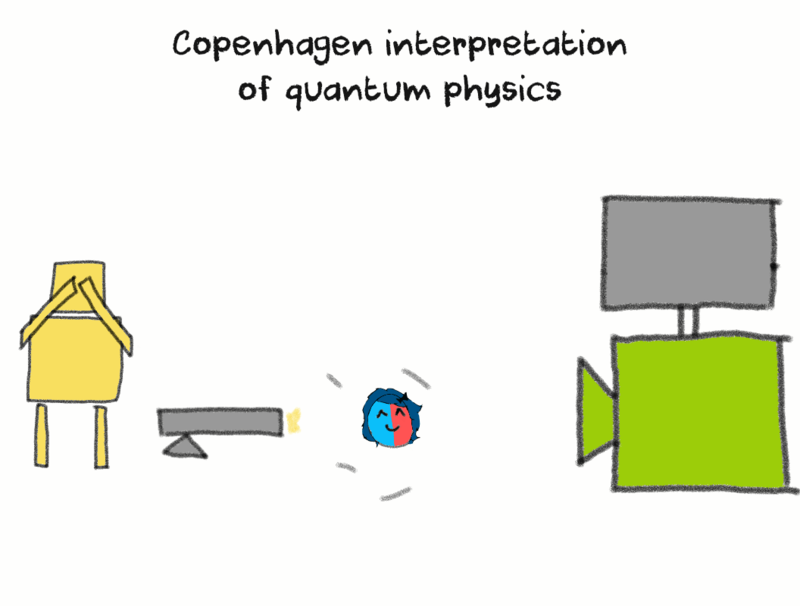 Later versions of the Copenhagen interpretations were modified to account for decoherence, a concept that wasn’t around in the first few decades of quantum mechanics. Decoherence seems to solve the measurement problem once and for all. According to decoherence, the wave function collapses because the quantum system interacts with the environment, becomes too complex to stay in superposition and then collapses on a single state. This then generates observable information that is classical physical in nature. But there’s a catch to this, and because of this the measurement problem still exists. Let’s go back to the quantum system as it tried to reach a common state for all of the particles involved. The particles in the quantum system failed to reach a common state (i.e. color) in the first two tries. It was only in the third try that they finally decided on a single state, in this case green. At that point, they left the quantum realm and entered into the classical physical realm. However, the particles in the quantum system didn’t choose only green as the single color state they should adopt. They simultaneously chose all other possible colors. In other words, the quantum system itself was then in a superposition of red, green, yellow, blue and so on. Nature now has a huge list of possibilities to color the quantum system. But for some reason, out of all the possible states the quantum system could have been in, it chose the color green. Why did the quantum system choose the color green, and not any of the other colors? And this is where the measurement problem comes up again. Nature is completely probabilistic. Nature just randomly chose the quantum system’s color to be green, without any particular reason. There was a certain chance it could have collapsed on any of the other possible colors. This is the standard Copenhagen approach. Some scientists claim that while all of the other colors were possible, green had the highest chance. 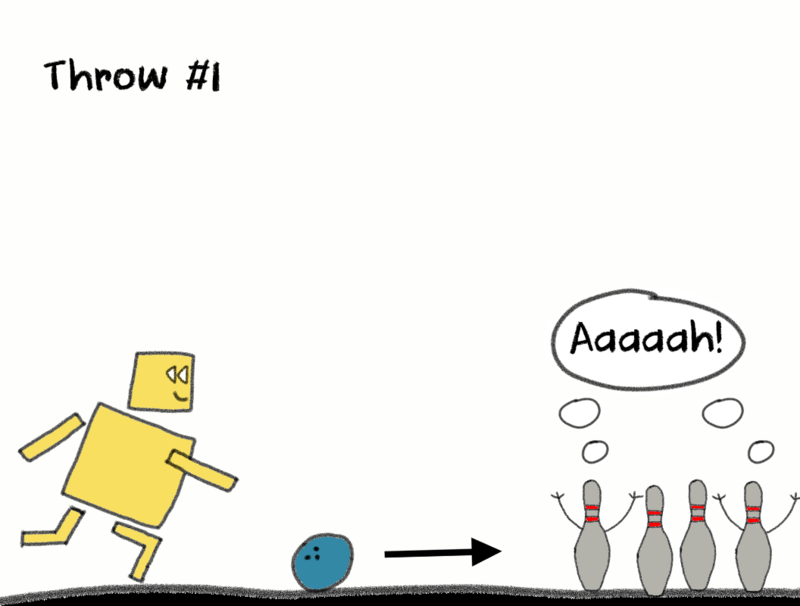 So the quantum system had a 60% chance to be green, but 10% chance for either blue, red or yellow. The quantum system was always predetermined to select the green state, because there are some hidden variables within it that make it behave in a deterministic and predictable fashion, rather than a probabilistic and unpredictable one. This is called the “hidden variable theory”. The superposition of all those possible colors didn’t collapse to become just green. Instead, all possible colors were chosen, but each color now exists in its own separate Universe. This means that a different Universe was “created” for each of these possibilities. Welcome to the Many Worlds Interpretation. Many Worlds’ interpretation is the second most popular after Copenhagen. It’s attractive in its simplicity, but requires you to accept some pretty “out there” implications. 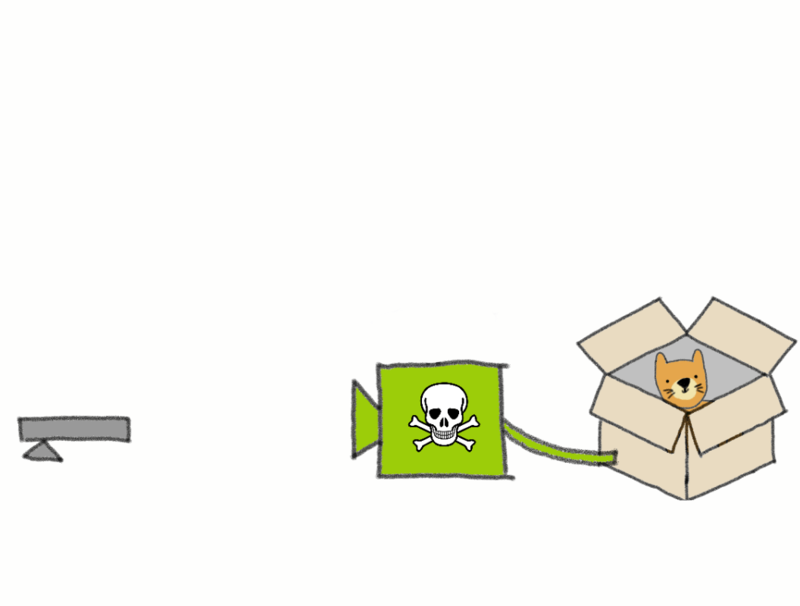 Let’s talk again about Schrodinger’s cat. In the standard Copenhagen interpretation, there’s a 50% chance the cat will live or die, depending on what color happened to measure. However, under the Many Worlds interpretation the measurement doesn’t collapse a particle’s superposition. Instead, both possibilities are realized, but in different, parallel Universes. In other words, you will end up with two separate Universes, where the cat is alive in one and dead in the other. This same process applies to all the other particles in the Universe. 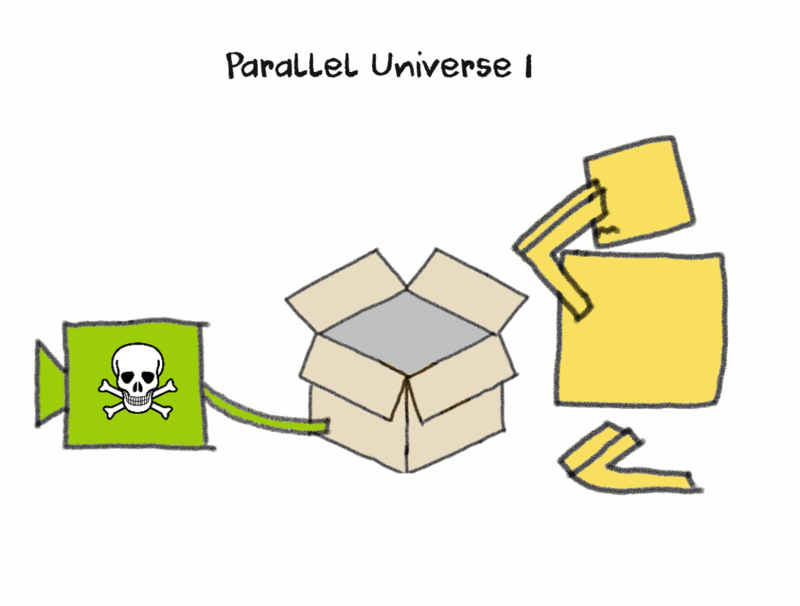 Each possible permutation of a particle’s state will branch of in a separate Universe. A photon that travels between the Sun and the Earth will generate a whole bunch of other worlds along the way. What you end up with is a practically infinite amount of Universes. And each new Universe will also generate a near endless amount of other Universes. It’s worth keeping in mind that the Many Worlds Interpretation has multiple versions of its own. 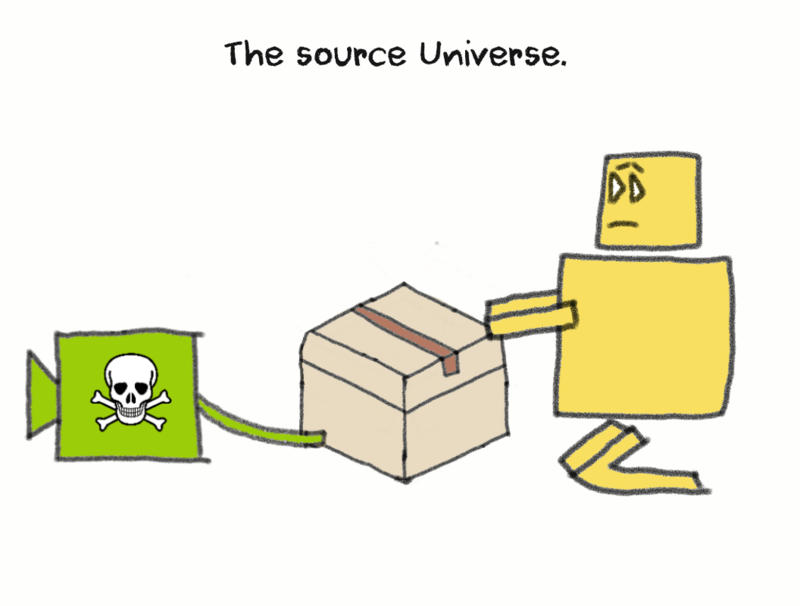 One version says that there is only one Universe, but just like a particle, it exists in a superposition of states. Each one of these states is its own “world” so to speak. So basically, you reading this article is just one of the states that a single Universe can take. From a mathematical perspective, the Many Worlds interpretation is the simplest of all the other interpretations since it simply requires you take the numbers at face value. There’s little to no need to add any more physics and complicated equations. It also solves the measurement problem, since the Universe branches of into different other Universes (or states, if you will) based on the actions of even individual microscopic particles such as neutron or photons. No need for an observer or even a measurement. By its very nature, it is impossible to prove the Many Worlds interpretation. You can’t come up with an experiment that conclusively says “Aha! Here’s how you can travel to a parallel Universe.” You pretty much have to do a leap of faith and take it “as is”. Do you really need to generate a near infinity of Universes in order to explain a measurement problem? This is an application of Occam’s Razor, according to which you should always choose the simplest hypothesis to explain a notion. As it stands, quantum and classical physics are two separate theories that don’t mix well. Ever since quantum theory established itself as a field of it’s own, scientists have sought to discover a “theory of everything” in order to unite the two. Their hope is that such a theory could at once explain everything we don’t know about the Universe, including the measurement problem. Because of this, the “theory of everything” would be a truly monumental moment in understanding quantum physics, and also who we are. It would probably change us forever. Here’s to it’s fast discovery.